Rare beef is red, Roquefort is blue. Carrots are orange, but I love a brown roux. As the theme of this issue is colour, I was planning on adding to this doggerel with a full colour-pleasing palate. However, while raw foods come in many colours, the Flavour Guy knows that cooked food yearns to be brown. This is when onions caramelize, when toast cries out for butter, when the roast is ready and the skin crackles. This is also the point when danger is at your elbow and catastrophe is seconds away. Left a moment too long, brown turns to black and yummy yields to yech! Standing at the precipice between dinner and disaster is part of the joy of cooking for me, and I have fallen many times, my attention shifting at just the wrong time; the chicken changing irrevocably from a delectable golden brown to something indistinguishable from the coals. That is why I praise our latest kitchen gadget. While leading gastronomes are investing in expensive technology that can, for example, emulsify olive oil into ice cream, the Flavour Guy latches onto the Roto-Broil 400. Don’t look for it at Wal-Mart or Sears; eBay is more likely. This is a futuristic cooking machine—a 17-pound stainless steel behemoth—created in the 1950s. The writing on its tempered glass front claims it can barbecue, roast, broil, toast, grill, fry and boil. Essentially, it has a large internal coil that gets hot enough to make almost any meal. One picture from an early ad shows coffee perking on the top as breakfast cooks inside. For years, our Roto-Broil 400 sat ignored in the garage. Before that, it was almost the only “modern” small kitchen appliance that my mother-in-law owned. Who needed a Cuisinart, when a knife and a chopping board would do? Why buy a blender if you could handle a whisk? But a Roto-Broil—“the 7-way complete electric kitchen”—how could you be without it? With a mechanical wheeze, the machine kicked into gear and the roast started to turn. Through the glass door, I watched the meat slowly and evenly brown. More fascinating, chunks that I had not tied properly started to flap around and then, as the roast revolved, errant pieces fell back into place. I imagined a large chicken rotating with wings waving at me as they went by. To convince myself that I was actually cooking, I occasionally opened the door and basted the meat but really, I had nothing to do but watch. Some people relax looking at fish in an aquarium. 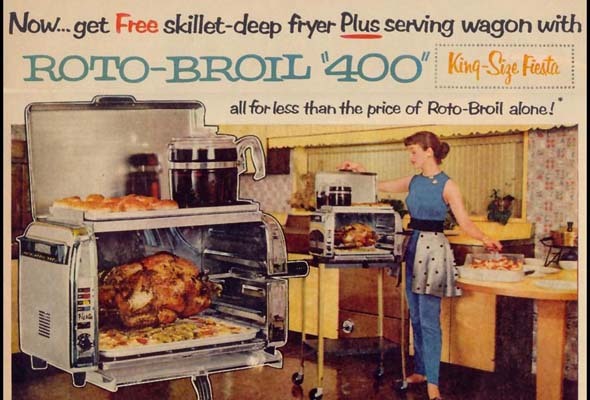 I had the Roto-Broil 400. If “zen and the art of cooking” was a TV show, this would be it. Two and a half hours later the crust had seared to a perfect dark brown and the meat was done: dinner à la mode, circa 1958. Recently we returned from a farmers’ market. We had an armload of basil leaves, succulent tomatoes, and I remembered that there was a chunk of Romano cheese in the fridge and some pine nuts. Obviously, I should make a pesto but I didn’t want to go through the effort of mixing a paste. Instead, I quickly put together a deconstructed pesto pasta. Finely chop a clove or two of garlic, slice a green onion (also called a scallion) and a large tomato into bite-size bits, tear a handful of basil into small pieces. Slowly toast a couple of tablespoons of pine nuts in an oven or frying pan until they are golden. Make sure they don’t burn. Boil a large pot of water, and add a cup of penne pasta per person. Cook until it is almost done. It should still be toothy. Remove it from the hot water and cool it quickly in cold water. Save a cup of the hot pasta water. In a large frying pan, heat a couple of tablespoons of olive oil. Slowly sauté the garlic and scallions until they are soft but not brown. Add the tomato and cook until it starts to stew, add the basil. When the leaves wilt, add the pasta, reheat it and, as necessary, add just enough of the pasta water to make a sauce. Toss in the pine nuts with a tablespoon or two of grated Romano or other hard Italian cheese. Serve with more cheese at the table. Leftovers make for a delicious pasta salad the following day. 5 Comments on "Flavour Guy: Back to the future with the Roto-Broil 400"
Do you have any idea where I can find a Roto Broil 400 Capri or king or …? 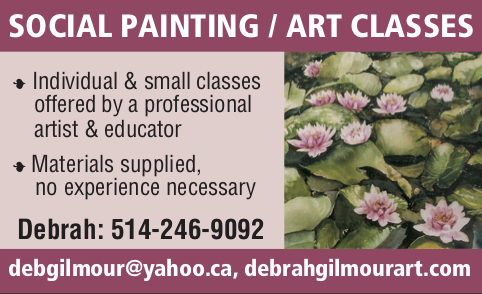 You could try places like eBay, Craigslist or Kijiji. Just put the word out and see what happens. I just recently was given one,after the loss of my uncle, it’s still in the box(for what you imagine a 50 year old box to be) It’s never been used. I have a great appreciation for vintage items, but don’t have room for this one. Looking to sell.